Global rating agency Standard & Poor's (S&P) has said that it could raise India's sovereign rating if the economy reverts to real per capita gross domestic product (GDP) growth of 5.5 percent. The rating agency in its report Asia Pacific Sovereign Rating Trends said: "We could raise the rating if the economy reverts to a real per capita GDP trend growth of 5.5 percent per year and fiscal, external, or inflation metrics improve." "Conversely, we may lower the rating if the government's structural reform agenda stalls such that economic growth does not accelerate, or fiscal and debt ratios fail to improve," S&P said. According to S&P, the stable outlook rating for the next 24 months reflects its views that the new BJP-led government has both the willingness and capacity to implement reforms necessary to restore some of India's lost growth potential. The agency also said the new government should also have the willingness and capacity to consolidate its fiscal accounts and permit the Reserve Bank of India to carry out effective monetary policy. The S&P expects that political developments in few Asia-Pacific sovereigns will be an important factor in shaping credit trends in the next few years. "New leaders in India and Indonesia have made changes that are welcomed by investors after they came into office in 2014," S&P said. Further reforms that improve the investment climate and strengthen fiscal health in India and Indonesia could brighten long-term growth prospects. In both countries, under-investment in infrastructure has resulted in constraints on development. Diverting funds from subsidies to public investment and reducing barriers faced by businesses could unlock growth potential and strengthen credit support for these sovereigns. The RBI's surprise 25 basis points repo rate cut early this week has been greeted with widespread enthusiasm by India's corporates. With banks expected to lower the rates in response to the central bank's rate cuts, the belief is that this marks the start of an easy credit cycle. I am not sure whether the rate cuts would readily translate into lower cost of capital for borrowers in the short-term, for atleast two reasons. 1. The more substantial economy-wide impact of the rate cut will be felt when the overwhelming majority of corporate borrowers, the small and medium enterprises, have access to cheaper credit. This is unlikely to happen anytime soon given the circumstances. Hobbled by distressed assets and declining capital adequacy ratios, banks are likely to be averse to assuming riskier loans, leave aside providing them at cheaper rates. 2. There is a strong likelihood that the banks may find the rate cuts as an opportunity to atleast partially ease the burdens from their distressed balance sheets. The temptation to only marginally lower lending rates while proportionately lowering deposit rates would be high given the proclivity for lazy banking among the country's banks. A recent Business Standard article gave an indication of the dominance of risk-free margin (spread between 10 year G-secs and deposit rate) on the banking sector's pre-tax profits. The debate triggered by the remarks of the Governor of Reserve Bank of India, Raghuram Rajan, on the central government's high-profile "Make in India" campaign missed an important insight about the strategy that should be adopted to encourage manufacturing. The Governor had cautioned about excessive focus of the campaign on both manufacturing and external markets and suggested "Make for India". So, how are 'Make in India' and 'Make for India' different? Both are anchored around the East Asian manufacturing-led rapid economic growth strategy. The success of the East Asian model depended on both domestic and external demand. Proactive government policies encouraged manufacturers who produced export quality goods for both domestic consumption and exports. In all these cases, the domestic demand was supported by a wide enough consumer base for good quality products and the domestic market in turn provided the platform for manufacturers to develop and refine those products to world-class standards. 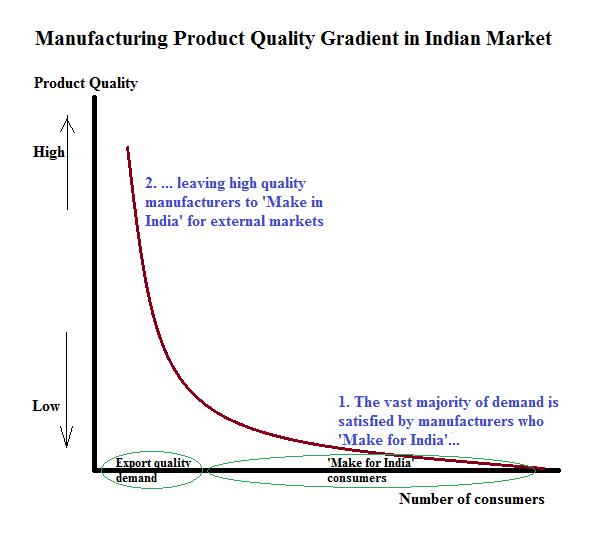 In contrast, manufacturers in India may struggle with domestic demand. The headline numbers that proclaim large declines in those living 'below the poverty line' (BPL) does not mean that the new entrants into the 'above the poverty line' (APL) are ready for middle-class consumption. In fact, as a MGI report from last year shows, atleast 56% of the country's population do not have the resources for their basic needs. Further, nearly 95% of the households make less than Rs 1.5 lakh a year. It is fair to argue that these consumers are likely to be deeply price sensitive and less concerned about quality beyond some basic considerations and durability. Only a tiny sliver of the market is likely to be demanding on quality. A manufacturer making automobiles, clothing, or consumer durables is therefore encouraged to keep costs down, thereby discounting for quality. Margins are also minimal in this side of the market, thereby limiting their ability to expand or move up the quality escalator. Needless to say, none of these products can be exported. Export quality manufacturers are constrained by the limited domestic market base to refine their products through a "learning by doing" approach. In the circumstances, India's manufacturers have two choices - 'Make for India' or 'Make in India' for export markets. As illustrated, they are qualitatively different choices. The former leaves them entrapped in a low-level equilibrium, exit from which is very difficult. Its market dynamics makes it difficult for these manufacturers to re-orient their production to also meet export markets. Further, manufacturers in this end of the market face stiff competition from cheap imports from competitors in China and elsewhere who have moved up the quality chain and can therefore produce the same quality at far competitive prices. Therefore any campaign to 'make in India' by 'making for India' is unlikely to achieve intended results, atleast in the medium-run. The latter choice - 'make in India' for external markets - requires technological and professional expertise, which only a handful possess, and an enabling infrastructure and policy environment, which is sorely deficient. Here, India has sought to emulate the latest entrants into the "flying geese" model like China and Vietnam where public policy encouraged greater external-market focus through the establishment of export-only Special Economic Zones. But in order to make an impact, this strategy requires massive investments on infrastructure in these zones and its surrounding areas as well as equipping public systems there with much greater state capability. Further, it also assumes the presence of a receptive external market. The reliability of these assumptions are, at best, questionable. Being rich and being wealthy seems to be synonymous as both involves having a lot of money. However, there’s a big difference between the two. If you notice, there are a lot of so-called ‘get-rich-quick’ schemes but there are no ‘get-wealthy-quick’ schemes. The main difference between being rich and being wealthy is knowledge. Wealthy people know how to make money while rich people only have money. Rich people are motivated by money but wealthy people are motivated by their dreams, purpose and passion. Most rich people make a lot of money with their paychecks but the moment they stop working, they also stop making money. Being wealthy is defined as that status of an individual’s existing financial resources that supports his or her way of living for a longer duration, even if he or she does not physically work to generate a recurring income. For example, if a person’s monthly expenses amount to Rs. 25,000 and he only have Rs.100,000 in his savings, his wealth is approximately four months or 120 days. Wealth, therefore, is measured in time, and not in amount of money that you have. It suffices to say that wealth is dependent not only to the amount of income but also to amount of expenses one makes. Wealthy people can build sustainable wealth that can last for years through asset investments producing multiple streams of income. Rich people, on the other hand, may get money in an instant such as inheritance or winning a lottery. However, because of lack of proper mindset and poor money management skills, all of it can be lost in a short period of time. It makes sense that if you did not work hard to earn and build it, then it can just easily pass on your hands and splurge it on things which are not important. Some of these people are more commonly known as ‘one day millionaires’. Now they have it, the next time they don’t. Wealthy and rich people both may experience downfalls and failures in their ventures. However, because wealthy people are knowledgeable when it comes to money matters, they can start all over again and build wealth over time. In contrast, rich people may find it hard to attain what he or she previously has. In essence, wealthy people are financially free while rich people are not. Since wealth is not an overtime success, one must learn to distinguish an asset from a liability. Focus on creating and buying income-producing assets to generate a passive or a portfolio income. How Strong is Your Wealth? The objective of calculating your wealth is to have your passive and portfolio income equal or greater than your monthly expenses. The moment you have a ratio of one is to one or more at any given month, then it indicates that you have increased your financial capacity to live a better life. On the other hand, if your wealth ratio is less than 1, it implies that you are still in a financial dilemma and your cashflow does not meet your basic life standard. As I have discussed in the 3 types of income, passive income is the residual income that you get from compound interest or compound growth. They come in the form of rental income from real estate properties, residual income from network marketing or franchises, interest from savings and time deposits, income from a virtual assets, etc. Meanwhile, portfolio income comes mainly from paper investments such as stocks, bonds, trust funds, and other marketable securities. The key in improving your wealth is to regularly monitor and increase your passive and portfolio income by increasing your means to earn more instead of acquiring more expenses. The moment you decide to make the passive and portfolio income a part of your financial habit and discipline yourself in building it, your are on your way to financial freedom. This is the path in maintaining a strong wealth foundation. The latest IIP figures on the Indian economy makes dismal reading. It fell 4.2%, its worst performance in three years, on the back of weak manufacturing performance. This was despite the festival season and a favorable base-effect. So, despite all the "animal spirits" released in recent months, what's going on? Growth in consumer durable goods for instance was 2.6% and 2.0% in 2011-12 and 2012-13 respectively, and then declined by 12.2% in 2013-14 and further by 12.6% in the first half of 2014-15. Clearly, households are not spending on non-food items. The reason is not hard to guess. Food inflation has eroded the spending power, as Consumer Price Index (CPI) inflation has been high averaging 10.2% in 2012-13, 9.5% in 2013-14 and 7.4% in 2014-15... industry has cut back on investment. This is mainly due to surplus capacity with the average capacity utilization rate coming down from 77.7% in first quarter if 2011-12 to 70.2% in the June quarter if 2014-15. Quite clearly, low consumer demand translates into lower demand for intermediate, basic and capital goods. Add to that the surplus capacity in a high interest rate environment and investment is bound to be curtailed. For an economy where consumption makes up nearly 60% of the output and therefore critical to do the heavy lifting, this weakness is very damaging. As Mr Sabnavis identifies rightly, the prolonged period of inflation is the major culprit, having significantly eroded purchasing power among the workforce. To get a sense of the wealth erosion - the 9% average inflation over the 2008-14 period, exactly halved our purchasing power. It is reasonable to assume that incomes would have grown by far less to compensate for the loss. The steep negative impact on aggregate demand is understandable. The importance of RBI's stance on inflation has to be seen against this backdrop. In the circumstances, as I have blogged earlier, there are two important parts to restoring economic growth - revival of credit growth and investment. Non-food credit growth, currently languishing at less than 10% has to return to atleast 15-20% levels. More importantly, infrastructure credit growth has fallen precipitously from its heady 35-40% growth rates in 2010-12 to less than 15% in 2013-14. Excluding power sector, itself weak, the infrastructure lending performance is poorer still. There are two important requirements to meet this target. One, any rise in credit growth is contingent on the ability of banks to meet the demand. Here the weak balance sheets of the public sector banks, who supply over 80% of the bank credit, is a major constraint on lending, even if investment demand picks up. Large scale recapitalization is arguably the most urgent macroeconomic policy requirement and it is unlikely to materialize by merely divesting bank share holding. Two, in the absence of investment demand - both due to the weak infrastructure investments and the anemic consumer demand - the government becomes the engine to trigger investment revival. Unfortunately, it does not have the fiscal space to finance infrastructure investments. This is reflected in the marginal budget allocations made for even flagship projects of the government, with unrealistic hopes being thrust on private sector and public private partnerships. The additional fiscal space come from either increased tax revenues and squeezing expenditures elsewhere. But both direct and indirect tax collections have been disappointing - 5.8% growth in indirect taxes against the budget estimates of 25% and 7.09% growth in direct taxes against the budget estimates of 15.31% in the April-September half year. This is not surprising given weak demand, low corporate investment appetite, and anemic economy. Cutting welfare spending is politically contentious and better targeting through Aadhaar will take time. Thanks to the one-step forward, half-step backward reforms, the windfall from the more than 40% drop in oil price appears unlikely to be fully reaped. Most of the measures to improve revenues and optimize expenditures are diffuse and long-drawn and unlikely to yield similar windfall. All this highlights the adverse headwinds that the Indian economy has to navigate before it can start growing at 6-7%, leave alone the heady 8-9% rates. And I am not even talking about these long-term trends. In the circumstances, the journey towards regaining a 6-7% growth rate looks likely to be painstaking and long-drawn. Talking up the economy can only take you so far, and there are no magic reform pills available in the government's armor. Will Narendra Modi 'Make It or Break It' in 2015? Narendra Modi stood as the hero of the year 2014. Many promises came along the way which he certainly needs to keep for the following year as well. Now is the time for speculations and there is little doubt whether this man who dominated 2014 can dominate 2015 as well? The Firstpost has been reporting on the progress of Modi’s revolutionary initiatives and the results vary a little from the promises he made. There is no doubt that the Prime Minister’s achievements so far are spectacular, he has been winning election after election for his party—the most recent one being Jharkhand. He succeeded in his efforts to give the prime importance to PMO’s office in policy matters. R. Jagannathan of Firstpost says that, “he is not just primus inter pares, but numero uno in all things that matter in this government,” which has been true so far. He has done things which the previous government was clearly unable to do. He not only changed waves but created his own waves in foreign policy, which is probably his most successful side so far. Manohar Parrikar and Suresh Prabhu were the highlights of his diplomacy; this move brought good changes in defense and railway leadership, which was the need of the hour. India's Twelfth Five Year Plan estimates a trillion dollars investments in infrastructure. But atrifecta of problems threaten to pour cold water on these ambitions. One, governments, both at the center and in states, are fiscally strapped and are likely to remain so even after recovery takes firm hold. Two, debt-laden infrastructure firms, especially in power and transport, have little or no space within their balance sheets to take on newer projects. In any case, despite all the hype around PPPs, many of these projects are hugely risky and are not amenable to such financing. Third, banks, especially the public sector ones who make up nearly 80% of the lending, are struggling with double-digit impaired assets and are touching their sectoral exposure limits. Even with the most aggressive reforms, the situation is unlikely to change in the foreseeable future. Faced with this perfect storm, governments appear to believe that the way out is by collaborating with foreign governments. More specifically, in partnerships with East Asian governments, whose large investible foreign exchange reserves are currently invested in low-yielding US Treasury bonds. In the face of global economic weakness and ultra-low interest rates in developed economies, these countries have limited investment options. In their search for yield, the sovereign wealth funds and external lending agencies of countries like China, Japan, and Singapore have been scouting higher-return long-term investment opportunities across the world. The size of India's economy and its relative strength makes the country an attractive investment destination. Realizing this, a few state governments and the central government have been aggressively wooing these governments. The successful summit meetings of the Indian Prime Minister with counterparts from Japan and China have provided a fillip to these explorations. Investments in infrastructure and manufacturing, both public and private, are being pursued on the back of bilateral agreements between governments. Such investments come essentially in two forms - long tenor concessional loans to finance infrastructure projects and financing of large industrial parks through joint ventures between public and private entities of the two countries. An MoU between the governments of India and Japan commits Japanese capital to the development of a 1500 km dedicated freight corridor between Delhi and Mumbai. Similar partnerships are being explored with Japan to finance a 534 km high-speed rail link between Ahmedabad and Mumbai at a cost of Rs 54000 Cr and with China for a 1700 km Chennai-Delhi link that would cut travel time from 28 hours to just six. MoUs have also been signed with the Chinese government to dovetail funding from China Development Bank for two large industrial Special Economic Zones (SEZs) in Maharashtra and Gujarat. The Indian and US Governments have signed an MoU to develop three smart cities at Ajmer, Allahabad, and Visakhapatnam. The government of Andhra Pradesh have signed an MoU with the Singapore government to develop the nucleus of the recently formed state's new capital city near Vijayawada. Similar MoU is being planned with Japanese government to develop the Vizag Chennai industrial corridor and facilitate Japanese companies to invest there. Such government-to-government partnerships have the potential to herald a new paradigm in attracting investments. However, they come with several cautions. 1. Whatever the spin given, such investments in infrastructure are essentially public borrowings to be repaid over a long duration by government entities at different levels. Therefore, given the limited fiscal space, we need to be cautious not only about the scale of debts assumed but also about its public utility. In particular, instead of frittering away scarce money on grandiose aspirational projects with disproportionately low socio-economic utility, we need to channel it to financing projects which carry the greatest bang for the buck. This assumes greater significance since the counterpart governments are more likely to be interested in precisely such grandiose projects - like high-speed rail or metros - which offer the potential of highly attractive returns for their contractor and supplier firms. 2. Another concern arises from the procurement conditions attached with such lending and investments. For example, lenders invariably insist that the contract be awarded to and procurements made from their firms. This raises concerns about whether public resources are being spent in the most cost-effective manner and on the most efficient technologies and appropriate systems. Even with the potential for joint ventures, Indian firms are likely to lose out to the larger and better endowed counterparts from these countries. Further, as experience of similar partnerships for real-estate based developments between state governments like Andhra Pradesh and Kerala with Middle Eastern governments have shown, the potential for cronyism and corruption are never far away. 3. The Chinese, in particular, see development of SEZs in partnership with Indian agencies - MIDC in Maharashtra and DMIC in Gujarat - as excellent platforms for facilitating Chinese companies to invest in India without the general hassles associated with investing in the country. It could help orderly flow of production factors from China to India and an enabling regulatory framework that are required to support such investments. But given that Chinese imports are already out-competing Indian manufacturing, once these units become operational, the additional incentives that come with SEZs are unlikely to go down well with Indian manufacturers. In any case, there are enough doubts about the wisdom of encouraging manufacturing growth through the SEZ route. 4. There are also concerns about the dynamics associated with Chinese investments which are certain to generate controversies and disputes. Howard French has written about thecontroversies surrounding Chinese investments in Africa on the displacement of local labor by Chinese migrants, racially clouded interactions with locals, and crowding out of local entrepreneurs and businesses. The visa problems faced by Chinese boiler-turbine-generator makers for Indian power plants and spying charges against Chinese telecoms equipment makers are cases in point. 5. Finally, there are all the other risks and limitations associated with such capital inflows. Since these loans are foreign currency denominated and unhedged and the investments generate rupee cash flow, they leave the Indian government counter-parties exposed to foreign exchange risks. There is also a limit to such investments - a handful of iconic infrastructure projects and SEZs that are likely to materialize through this route can at best scratch the surface of requirements. Investing isn’t done in a vacuum. Thanks to globalization, most economies in advanced as well as emerging economies are now intimately connected—and when one of them topples, it can cause a ripple effect around the entire globe, affecting investors worldwide. That’s why it’s imperative for any smart investor to be aware of the macroeconomic and geopolitical forces that are in play right now. Euro-crash. With a very real risk of deflation looming, the euro zone might become a destabilizing force in the global economy. Can Japan survive another lost decade? Abenomics may be backfiring, squeezing consumers, increasing economic hardship, and causing Japanese corporations to give up on their domestic market. China slowdown. China’s financial system is exhibiting signs of significant stress. If its economic growth slows too much, it will severely affect commodities and trade-driven economies, like the US. Geopolitical risks abound: Find out all about the seven biggest powder kegs in the world today. Dollar shock. The recent strengthening in the US dollar is viewed as a positive by most Americans, but the dollar’s upside could be limited by the crushing effect it has on emerging markets. Last Thursday night, I attended the Bloomberg BusinessWeek 85th Anniversary Dinner. I have an oped in Indian Express today that does a differential diagnostic of the challenge of making in India. Infrastructure, labor taxes, and improving business environment appear as binding constraints. The prime minister has declared his goal of “Make in India” with “zero defect” (quality) and “zero effect” (on the environment). As a vision statement, there could not be anything more appropriate. But walking the talk is, arguably, the challenge. India’s manufacturing has been a puzzle. Since the late 1970s, even as its peers in East Asia have greatly diversified into manufacturing, the sector’s share has stagnated at around 15 per cent of the GDP. It is not that past governments have not tried to revive manufacturing. For decades now, not just the Centre, the states too have had an industrial policy. At some time or the other, many states have even pursued it vigorously. Some of these policies have also been well designed. But the results have been universally disappointing. This alone should be adequate to chasten us about the task at hand. The revival of our stagnant manufacturing sector is arguably the biggest economic challenge India is facing. Unfortunately, the problem is complex and intractable, demanding several, often diffuse, sets of solutions. So what is holding back India’s manufacturing? The potential candidates are obvious, though their relative importance is contentious. Sorely deficient infrastructure, inhospitable business environment, corruption, poor quality of human resources, problems with access to timely and adequate credit, difficulty of getting land, high burden of taxation and restrictive labour regulations would figure prominently on any list. In an ideal world, public policy would be tailored to address all these problems. But in the real world, governments have limited resources and face serious administrative and political limitations. Further, many of these are intimately linked to the country’s stage of development. One way to prioritise among them is to do a differential diagnostic of the various constraints facing the sector to identify those primarily responsible for holding back manufacturing growth. In other words, such binding constraints are those factors whose relaxation generates the greatest bang for buck. This approach was popularised by economists Dani Rodrik, Andres Velasco and Ricardo Hausmann in the early 2000s and has since been embraced by many countries across the world in designing their industrial policies. In their own words, growth diagnostics is simply “a strategy for figuring out the policy priorities”. Simple as it sounds, in the context of India’s manufacturing sector, it is a formidable exercise. Here is a simplified diagnostic analysis of the sector. Infrastructure tops the list of most surveys on doing business in India. In particular, chronic deficiencies in transportation and power impose prohibitive costs and lower business competitiveness. Multiple enterprise surveys have identified electricity as the biggest constraint. Further, India lags behind on every measure of transport connectivity. Though there have been considerable recent successes spurred by private participation, much needs to be done. Credit access for small and medium enterprises (SMEs) is a concern even in developed economies. Interestingly, among the ten parameters in the World Bank’s Doing Business Survey (DBS), India scores best on access to credit, better than its emerging market peers. Other surveys also confirm this. The more important concern would be the undoubted difficulties faced by informal firms in accessing credit. But then, this is more a matter of informality than access to credit. Scarcity of land and skilled labour have already started troubling businesses, though it is difficult to describe them as binding constraints. Consider land: Over the last decade, several states have generously allocated massive amounts of land, virtually free of cost, for the establishment of manufacturing facilities. But, pointing to constraints that go beyond land, only a minuscule proportion of these investments have materialised. Our poor human resource quality — 70 per cent of the workforce is educated up to the primary level or lower, though only 10 per cent has received some skill training — is likely to emerge as a constraint in the days ahead. However, work of economists like Aashish Mehta and Rana Hasan finds little evidence that the skills gap is a binding constraint. It is more likely that businesses are unable to hire skilled workers at affordable wages. A more sustainable strategy to bridge the “employability deficit” is to fix the quality of school education. The regulatory hurdles are equally onerous. India has some of the most restrictive labour regulations. But evidence on growth in the manufacturing sector from states that have eased hiring and firing regulations is, at best, mixed. In any case, a gradual reform process on this is afoot and given its politically contentious nature, this could be the best strategy forward. A bigger constraint may be labour-related taxes, as pointed out by Manish Sabharwal in these pages (‘Pains of the pay cheque’, IE, November 25). They not only impose prohibitive costs on employers but also an unbearable burden on employees, thereby forcing both sides into informal contracting. High taxes erode business competitiveness. The 2015 DBS reveals that Indian firms’ total tax obligations are among the highest. A multiplicity of indirect taxes raises both the tax burden as well as administration costs. Fortunately, the rationalisation of indirect taxes through the proposed goods and services tax should significantly address this. In any case, our less-than-encouraging experience with tax concessions, the core of numerous Central and state industrial policies over the years, does not lend credence to the view that taxation costs are a binding constraint. Finally, we have the business environment. Here, I am referring to the interface with various organs of the government in accessing transactional services — procuring land, starting a business, getting utility services, enforcing contracts, resolving insolvency and recurrent routine contact. As numerous studies and surveys show, corruption and harassment plague these transactions. It has an even more pernicious effect on incentives. Such hostility encourages businesses to start and remain informal, thereby perpetuating India’s overwhelmingly dominant informal sector. All the aforementioned constraints bind with much greater force on informal firms. It also discourages expansion of small business, a major source of job creation, reflected in the “missing middle” of India’s firm-size distribution. While many of these transactions can be eased by simplifying the regulations concerned, their implementation would run into state capability and related governance problems. Apart from all these, sound macroeconomic policies are necessary to create a low-inflation, low-interest rate and high-growth environment that is essential for the country’s global manufacturing competitiveness. In conclusion, labour taxes, infrastructure, and the business environment appear to be binding constraints on the revival of India’s manufacturing sector. However, given the huge size and vast diversity of the country, a diagnostic for each state may be a more prudent strategy. In any case, instead of big-bang reforms, sustained efforts in multiple directions, which cumulatively generate large effects, are required to relax these constraints so that we can realise the goal of making in India.